These are, hands down, my new favorite food. I eat them solo, as a base for pasta sauces and float them atop soups as a super flavorful garnish. They are wonderful hot right out of the pan or cold the following day. They are a great way to add more potassium-rich vegetables to your diet, and if you’re looking for a pasta replacement, gluten-free or not, these lean green noodles are an awesome substitution. I’ve not given amounts of zucchini and garlic because it’s ultimately up to you to decide how garlicky you like your food. I use one clove per two medium-sized zucchini. Spiral slice or using a vegetable peeler, peel your squash making sure to turn it after each down stroke in order to keep the squash evenly peeled all around. Once you hit the center and begin to see the seed bed, toss the core. You do not want the seeds for these noodles. Generously salt the noodles and set aside for 30 minutes in a colander. Once the salt has pulled the water out of the noodles and wilted them, rinse them thoroughly under running water. Squeeze the excess water from them and then pat them dry using paper towels or a clean dish towel. Pour a bit of olive oil into a pan and heat over a medium flame. Add the garlic and sauté until fragrant but not browned. Add a pinch of red pepper flakes. 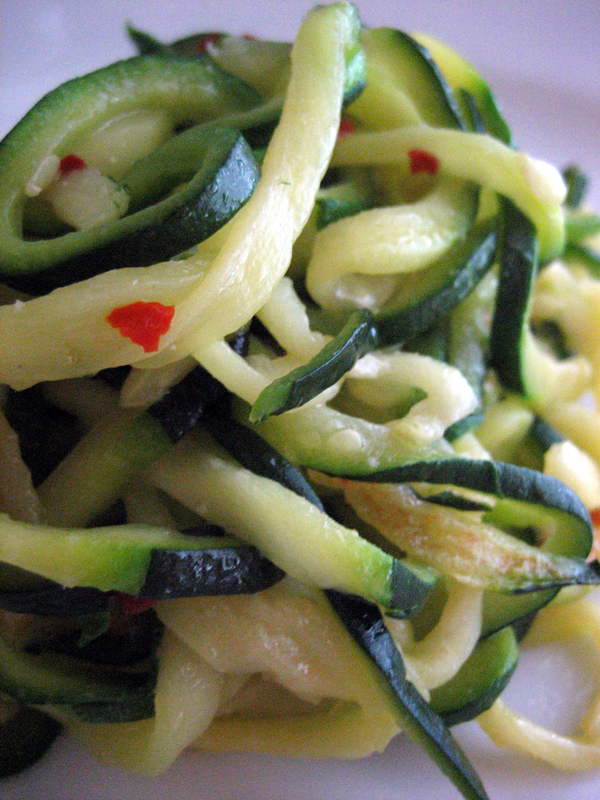 Add the zucchini noodles and toss periodically for about 5 minutes. Remove from the heat, and serve hot. 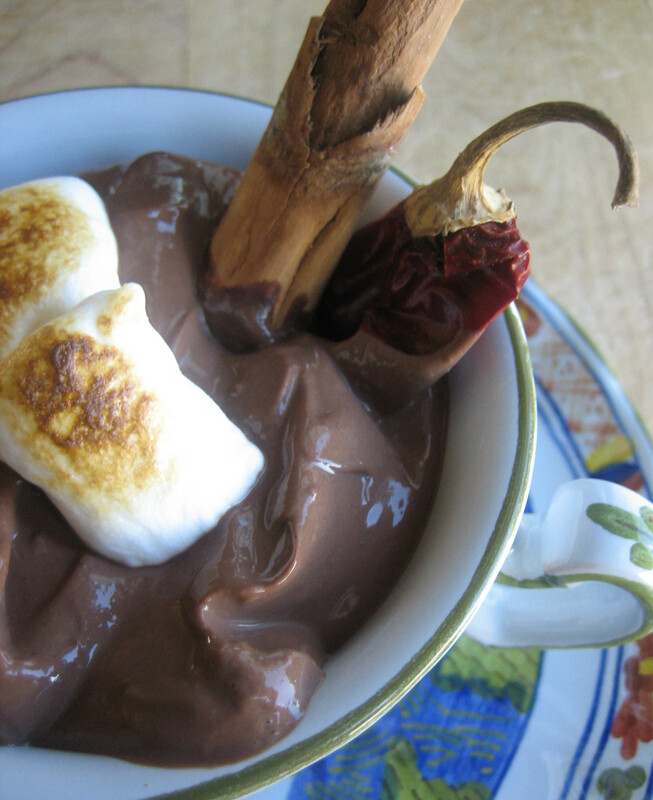 Here is a quick and easy, chilled and spicy treat for a hot late Summer’s night when you’re craving something thick, rich and abundantly chocolate. Add tofu to a food processor and pulse. Add cocoa powder, extracts, salt, espresso powder and spices. Process until incorporated, scraping down the sides at times. Add agave syrup until it’s as sweet as you wish. [The agave will also loosen up the consistency a bit because the cocoa powder will thicken the tofu.] Place in the refrigerator for at least 30 minutes to chill. Anytime I get to use my kitchen torch is awesome. I love this nifty little tool and used it to toast the tops of the marshmallows. Serve in a mug and garnish with a cinnamon stick, and/or dried chile pepper. Toasted almond slices would also rock the top of this.